Overall, the political situation in China is stable, with the Chinese Communist Party (CCP) firmly in power. President Xi Jinping has consolidated his power within the CCP, and is seen as the most powerful Chinese leader since Deng Xiaoping. Political stability supports the government in finding the right policy mix necessary to deal with the adverse consequences of the US-China trade dispute, to further rebalance the economy towards service and technology and to deleverage indebted local governments and state-owned enterprises. China´s growing international influence and power projection, e.g. with large direct investments in a range of countries in Asia and Africa, has caused some worries in both developed and emerging economies. Australia, the EU and Japan share US concerns about intellectual property theft, forced technology transfer and China’s less cooperative stance in multilateral organisations. Some emerging economies in Asia and Africa are putting a brake on Chinese ‘Belt and Road Initiative’ investments in order to avoid one-sided economic and financial dependence. The strengthening of China’s geopolitical clout and a more assertive stance in its territorial claims in the South China Sea, the conflict over the Senkaku/Diaoyu Islands with Japan and the Taiwan issue has led to balancing efforts by the USA, Australia, Japan, India and some smaller regional players. 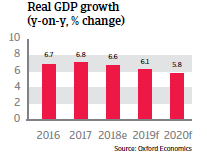 Growth of Chinese GDP was robust in 2017, but decreased in 2018. Private consumption held up well, but fixed asset investment growth as a key driving force of economic growth began to slow down last year due to government measures to rebalance the economy (away from export-oriented investments towards more consumption-led growth) and efforts of corporations to deleverage. Export growth decreased substantially in Q4 of 2018 due to lower global demand and the repercussions of the Sino-US trade dispute. 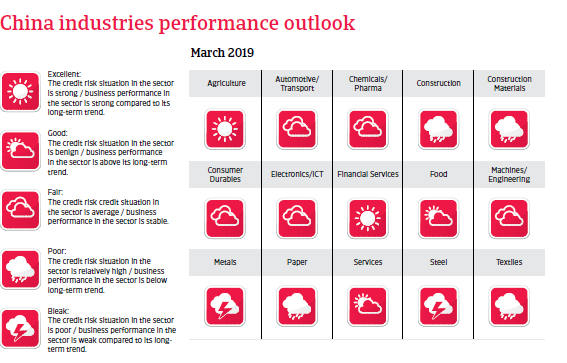 We expect the economic slowdown to continue in 2019, and downside risks have increased. It is unsure whether the current trade talks with the US will lead to an agreement. Even if an agreement about tariffs and trade is reached, the structural economic conflict between the US and China remains unsolved. The Chinese authorities have taken measures to support the economy, including a boost to liquidity, some easing of financial regulations and increasing infrastructure investment. However, the administration still faces a difficult balancing act between supporting economic growth and ensuring an orderly financial deleveraging process. Now that exports are decreasing and stimulus policies are slowing debt reduction, it could be more difficult to avoid a faster slowdown due to financial imbalances and significant excess capacity in some sectors. Non-financial corporate debt has increased to 164% of GDP, with very high leverage in the heavy industry segment. While progress has been made in reining in credit growth, lending to businesses in heavy industry sectors suffering from excess capacity has led to a significant deterioration of the quality of loans. The risk of a systemic financial crisis remains low for the time being, but a renewed pick-up in credit growth could eventually lead to more pronounced financial stress and increase the risk of market turmoil. Meanwhile, a move to dampening credit growth would mean slower, albeit more sustainable, GDP growth. 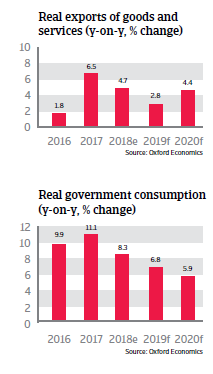 The central government’s fiscal deficit should increase further as stimulus continues, e.g. by lowering several business and consumer taxes and raising infrastructure spending. While government debt is gradually rising, it still remains at manageable levels. The sovereign’s position is supported by a large pool of national savings, which enables the state to finance its debt domestically, reducing any exposure to external shocks (total external debt remains low, at 14% of GDP in 2019). However, the financial situation of local governments is much more tense, not least because of quasi-fiscal spending that played a key role in infrastructure investment and growth promotion in the past. While high credit growth is a worrying development, banks are still adequately capitalized and official ratios of non-performing loans are low. Lowered reserve requirement ratios for most banks will support the financial sector’s earnings potential. The current account surplus has decreased to 0.2% of GDP in 2018 and will turn into a small deficit after 2020, due to weaker growth of goods export and a widening services deficit, the latter largely triggered by increasing outbound tourism. Business insolvencies in China are expected to increase further in 2019 due to the economic slowdown and the ongoing rebalancing of the economy away from manufacturing and towards services. Sector-wise highly indebted companies in industries with excess capacity like aluminium, cement, coal, construction steel/metals and commodity trading are very vulnerable. While the majority of listed and state-owned businesses still benefit from stronger support from banks and shareholders, more caution is recommended when dealing with listed companies with a high proportion of pledged shares and stock prices that have fallen substantially. The same accounts for small and medium-sized private businesses, as many of them - even those active in better-performing industries - often suffer from limited financing facilities. Due to the ongoing uncertainty over the future direction of the US trade policy Chinese businesses dependent on sales to the US remain vulnerable, especially in segments where US competitors are vocal in calling for an end to ‘unfair trade’, such as metal, electrical machinery/electronics, textiles and tyres.